On a chilly Saturday afternoon in Hamden, the Quinnipiac men’s lacrosse team was hot as it defeated Wagner College by a score of 11-3. Those good choices were evident as the Bobcats (3-3) only surrendered 11 turnovers to the Seahawks’ (2-4) 19. In addition, the Bobcats never gave up more than three turnovers in any quarter of play. 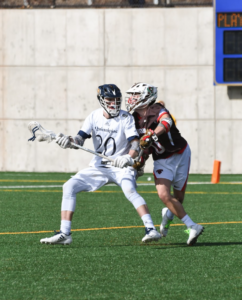 Junior attack Foster Cuomo and junior midfielder Matt Frost made good choices with the ball, as they were two of five Bobcats to register multi-point games. Cuomo’s four goals bring his season total to 11, which leads the Bobcats. Both players finished with four points on the day. On the backend, the Bobcats were able to shut down the leading scorer coming into the game, Seahawks’ sophomore attack Nick Ancona. Ancona had 10 goals and 11 points coming into the game and left adding just one assist to his season total. Penalties were all over the place in today’s game, but the Bobcats were able to hold the Seahawks to just three goals. Just as Palmer did, Fekete gives credit to the Bobcats’ d-corp. In total, there were 12 minutes of penalties in today’s game. The Bobcats recorded 10 penalties for 8:30 and the Seahawks four for 3:30. However, don’t let the numbers fool you. Several of the penalties were coincidental penalties, or penalties on plays where a player from each team was penalized. This shaves at least two minutes off each team’s individual total. Sophomore goalie Joe Zukauskas got the start in goal today and finished the game with only three goals against and eight saves. This marks the fourth start in a row for Zukauskas. The Bobcats look ahead to its first Metro Atlantic Athletic Conference (MAAC) game of the season, coming up against Siena College in Hamden on Saturday, March 17. The momentum that this win generated is going to be a big factor for the team heading into the start of conference play, according to Palmer.